The funny thing is, what I thought I would miss the most about smoking is having that morning cigarette with a cup of coffee. That is not what i miss right now. This morning was actually easy having my cup of coffee with a snus. It is now, when I'm sitting in my office, a bit tired before lunch, that I really want a smoke! My colleagues just went out to have their smoking break and I'm kindly sitting here at the computer. I tried a Northerner Wintergreen today. It is a purified portion that is cleansed from nitrosamines (carcinogenics). It is stronger than the Mocca Mint white mini portions and I really need that today. What I like about this Northerner snus is that the pouches are dry and freshly white. It also gives me a good nicotine rush. I think if I had a smoke right now I would feel quite sick, getting to much nicotine. However, I hope my cigarette cravings will pass soon. Why can't cigarettes be as healthy as smoking??! Well, stupid question and after all my researching I now the answer to it. 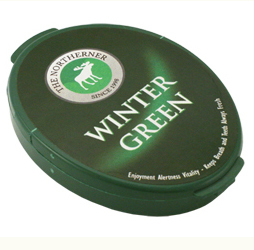 With snus you don't inhale any smoke. Secondly snus is pasteurized which makes it more healthy than tobacco that's been fire-cured or fermented.